I've fussed around so much with this card to try to get a good picture that I've just give up and added this one to show you all. The flourish was stamped on acetate before adding to the base card, it was stamped with white stazon ink. 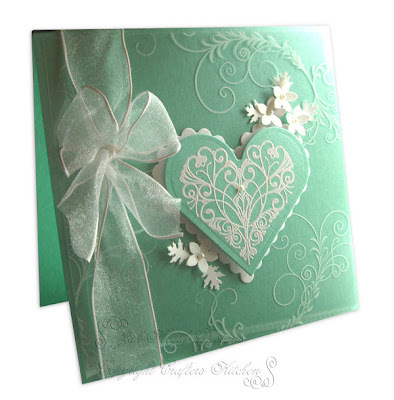 The hearts were cut with the Nestabilities dies the I heat embossed a heart stamp onto the Aqua coloured heart with white embossing powder and added the hearts to the card using foam pads. To finish the card I added punched flowers and leaves, a few pearls and a sheer ribbon. Beautiful Jak as always, love that colour it's fabulous! Wow Jak what a stunner, just love the colours. yet another stunning card Jak,it's wonderful! Could I be cheeky and ask where I might get the flourish stamp from please? That is so pretty and the colour is so fresh.....it's beautiful. What a beautiful card. Those flourishes are stunning and love the colour you have used. Absolutely gorgeous Jak, love the colour. Well, what can I say. Yet another gorgouse card, don't know how you do it. Just wish I was as talented as you. Well done love. Stunning card Jak, love it. Stunning, what a beautiful wedding card this would make. Another stunning card, Jak. Love it. This is a stunning card I love the colour and stamping with the white was a great idea. It's beautiful Jak, I love it, the colour is gorgeous. Jak whatever words I used to describe your card would just seem inadequate! Even stunningly beautiful doesn't really say what I mean....it's so so truly beautiful. I'm in awe of all your fabulous work and thank you so much for sharing it with us! Gorgeous, gorgeous, gorgeous, gorgeous, did i say it was GORGEOUS.I love it.